Leh(Ladakh), September 10 (Scoop News)-The Ladakh Marathon was organised on 09 Sep 18 at Leh under the aegis of RIMO expeditions, Leh. The Ladakh Marathon comprised of various events to include 42 km, 21 km, 07 km run. The Marathon was flagged off by Lt Gen YK Joshi, GOC 14 Corps. 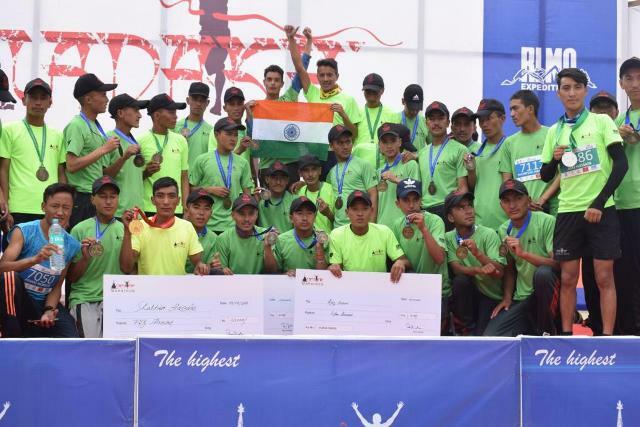 Continuing their winning streak in this prestigious event, the second and third positions in 42 km were bagged by Rifleman Ajaz Hussain and Rfn Jigmat Kunzang and in 21 km third and fourth positions were secured by Rect Jigmat Stobdan and Rfn Jigmat Norboo respectively of Ladakh Scouts Regiment. Proving their mettle in this unique high altitude run, which comprises a test of mental and physical endurance of the participants over a gruelling distance of 42 and 21 kms at an altitude of more than 11000 ft, the Ladakh Scouts runners re-established their supremacy by achieving ‘podium finish’ . This commendable achievement and the perseverance displayed by these athletes have been exceptional and has earned laurels for the Regiment and the Indian Army.